To work against the intense Aussie climate, our Wetseat neoprene seat covers fit on Nissans. We don’t want the fuss of a mess to stop you enjoying the great outdoors. Keep adventuring in your Nissan with Wetseat’s completely durable neoprene seat covers. We are Aussies making for Aussies, so we know best when it comes to the Australian lifestyle. Our Nissan neoprene seat covers are UV safe and highly water, abrasion and chemical resistant. No matter what your adventure is, know that you can keep playing in mud or surf without the fuss of a mess. We cover Nissan Navara models including the D23, DX, RX, SL, ST and STX. 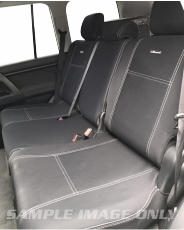 We understand the intense journeys you’ll be on and that’s why we cover these models to sit perfectly on each seat without obstructing features of your Nissan Navara. Our seats are 100% side airbag compatible to ensure not only a mess free trip, but a safe one. 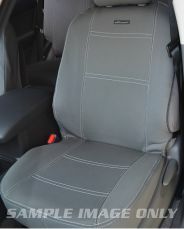 Our Nissan Neoprene seat covers are all ribbed with sharkskin grips to make sure they don’t slip and slide when you and your passengers sit down on the seats. No matter what the seats, our neoprene covers grip onto cloth, leather and vinyl trims. Don’t let your interior be a fuss when you’re adventuring the great Australian outdoors. We have your seats protected to ensure a fun yet safe travel.